Debra Prinzing » Post » ARE YOU A SLOW FLOWERS FLORIST? ARE YOU A SLOW FLOWERS FLORIST? and feature your American-grown botanicals! Slowflowers.com is a project of Debra Prinzing, writer, speaker, designer and consumer advocate. 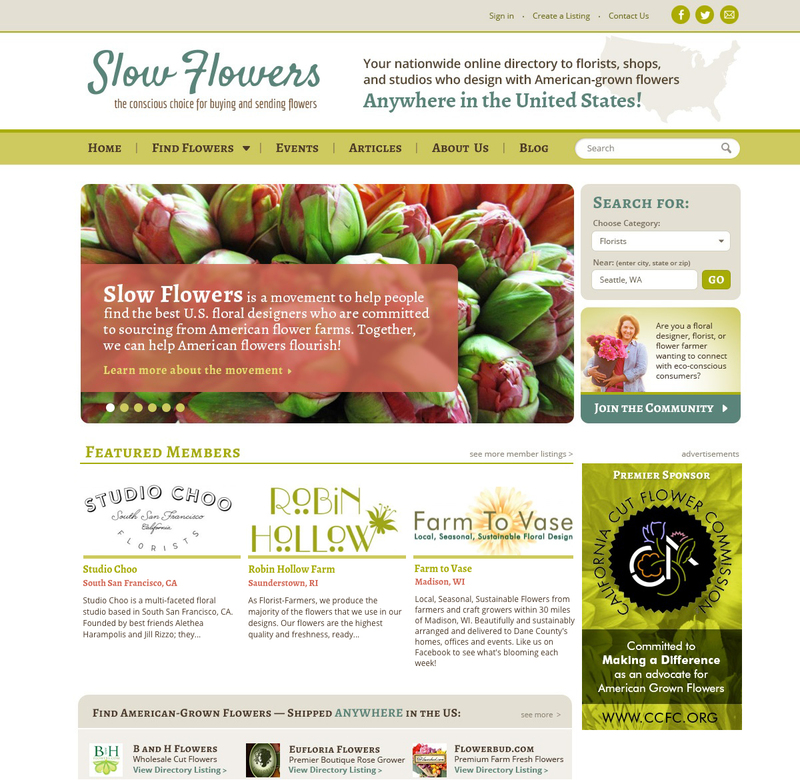 She created Slowflowers.com as a free, searchable directory that makes it easy for customers to find florists, shops, studios and farms who share a commitment to sourcing local, seasonal and domestic American-grown flowers. This unique resource positions you and your business as a floral industry leader whose values and ethos promotes local, seasonal and domestic flowers. By being part of the Slow Flowers Movement, you gain market differentiation from the competition – and strengthen your brand in the eyes of consumers and your distinct marketplace. What if you also sell/design with imported flowers? We understand that some members may continue to import from global sources. Floral businesses featured on Slowflowers.com will be asked to highlight and feature their American-grown product and to supply domestic, seasonal and local flowers when their customers request it. How do consumers use the site? Find studios and retailers who specialize in green weddings, weekly subscriptions and other services. Provide reviews and raves about their experience with a specific vendor. How can you list your business? The FREE Standard Listing includes your business name, address, phone number, email and web site URL. The PREMIUM Listing can be purchased on a yearly basis and allows you to create your personal page on Slowflowres.com. It includes the following: Business name, address, phone number, e-mail, website URL, logo, photo gallery of designs, summary and detailed descriptions, video and customer ratings/reviews. Please follow the USER GUIDE instructions to take advantage of the introductory Premium Listing offer of $119 (that’s only $10/month). This offer expires July 1, 2014, when new listing rates go into effect ($199/year). This entry was posted on Thursday, June 5th, 2014 at 9:27 am	and is filed under American Grown, Blog Posts, floral design, Slowflowers.com the Directory of American Flowers. You can follow any responses to this entry through the RSS 2.0 feed. You can leave a response, or trackback from your own site.